The Unesco-listed George Town inner city is set to see further rejuvenation with several projects to be carried out over the next two years by premium boutique property development and management company, 1919 Global Sdn Bhd. 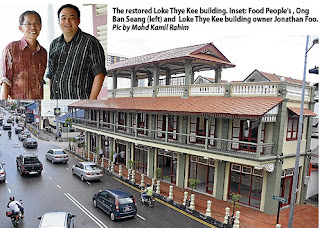 The company which has just completed the RM2 million restoration of the 83-year-old Loke Thye Kee building, is now set to rejuvenate its other properties in the city. "Over the next 24 months, we are looking to restore 17 shophouses and a cinema in the Unesco-listed core zone here," building owner Jonathan Foo told Business Times. The said buildings are the former Majestic Theatre which was built in 1926, a row of 12 shophouses along Jalan Phee Choon, and five heritage shophouses on Jalan Penang. The 'Penang Road Heritage Row' project, according to the company's website, is described as a " unique cluster of five two-storey heritage shop houses, offering high profile commercial shopfronts on the first floor and a collection of boutique homestay suites on the second floor." Meanwhile, the row of 12 two-storey shophouses, which are currently tagged as 'Phee Choon Place' are expected to house a collection of well-designed commercial and entertainment businesses on its ground floor, while the upper floor will offer luxury homestay units, featuring rooftop patios and other five-star amenities. Foo, who is a Singaporean, did not indicate a budget for the proposed restoration of the properties, but said that the next project the company will embark on would be the five shophouses on Jalan Penang, once approval has been obtained from the local authorities. On the company's plans for the former Majestic Theatre, Foo said all efforts will continue to maintain its heritage attributes as 1919 Global sets about restoring it into a commercial space. It was the first cinema in Penang to screen Chinese talkies, and the building offers 14,000 sq ft of double-height column-free space, with a distinctive and grand colonial facade. "Currently in the submission phase and once restored, the Majestic Theatre promises to be the prestigious venue for any commercial or corporate venture," Foo added. "As a company owning properties in the Unesco heritage area, we share the same goals as others in wanting to bring back life into George Town's inner city but we need to balance this with projects which are economically viable and businesses which are sustainable."